It is not always easy to control our body weight. 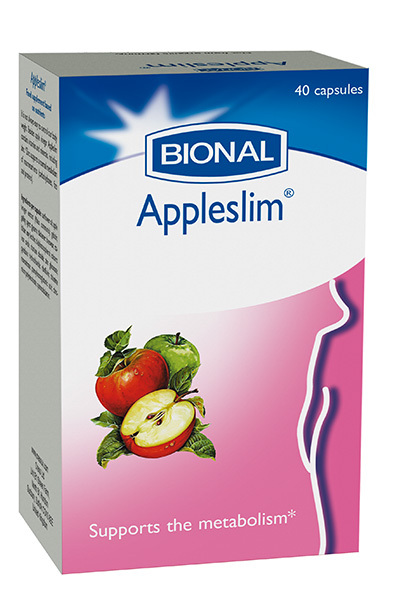 Besides apple vinegar Appleslim® contains vitamins and minerals, including zinc. *Zinc supports a normal metabolism of macronutrients (carbohydrates, fats and proteins). Adults: 1 to 2 capsules per day, to take half an hour before the meal with some water. Keep dry and store in a dark place. Keep out of reach of young children. Do not exceed the stated recommended daily dose. Food supplements may not be used as a substitute for good nutrition and healthy living. Sunflower oil; apple vineger extract (Malus communis); gelatin; gelling agent: glycerin; thickener: beeswax; stabilizer: soy lecithin; d-alphatocopherol; colours: iron oxide, titanium dioxide; zinc gluconate; pyridoxin hydrochloride; riboflavin; thiamine mononitrate; pteroylmonoglutamic acid; chromium polynicotinate; cyanocobalamin.